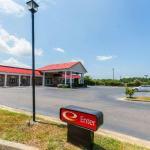 Free breakfast and Wi-Fi and well-equipped rooms add value for guests at the Econo Lodge Inn & Suites Orangeburg. The two-story Econo Lodge has exterior corridors leading to 90 rooms all equipped with mini-fridges microwaves and coffeemakers as well as free Wi-Fi and 50-inch flat-panel TVs. Non-smoking rooms can be requested. Grab a bite at the free continental breakfast in the morning before heading out to the outdoor pool. You'll also find a guest laundry. Parking is free and pets are allowed for a charge. The Econo Lodge is off Highway 301 about a half-mile from Orangeburg's center and 10 minutes from I-26. Guests can walk to a few shops and chain restaurants. South Carolina State University is a mile away. Edisto Memorial Gardens are a five-minute walk from the motel. Drive less than an hour north to explore Columbia's Riverbanks Zoo and Botanical Garden South Carolina State Museum and events at Colonial Life Arena. Columbia Metropolitan Airport is 40 miles north.